Issy Randall, proud owner of The Cupcake Cafe, is in love and couldn’t be happier. Her new business is thriving and she is surrounded by close friends, even if her cupcake colleagues Pearl and Caroline don’t seem quite as upbeat about the upcoming season of snow and merriment. But when her boyfriend Austin is scouted for a possible move to New York, Issy is forced to face up to the prospect of a long-distance romance. And when the Christmas rush at the cafe - with its increased demand for her delectable creations - begins to take its toll, Issy has to decide what she holds most dear. This December, Issy will have to rely on all her reserves of courage, good nature and cinnamon, to make sure everyone has a merry Christmas, one way or another. . .
Indulge yourself and your sweet-toothed friends with Jenny Colgan’s new novel, simply bursting with Christmas cupcake recipes and seasonal sugar-fuelled fun. Funnily enough yes they do, all the time. The last useful dream was a dinner party scene, which I immediately incorporated. The best I find is if you wake really early then doze off again. That's when you get the good stuff. As soon as I could hold a pencil really. I wrote a book about rabbits age 7 that my mum used to read out at parties- cringe. And screeds of terrible TERRIBLE poetry of course. My first novel was published at 26. Honestly, I really really hate the term chicklit- I wouldn't call any woman a chick! Anyway, that grumpy thing aside, I write romantic comedies because I love writing funny stuff- I was a stand up and wrote comedy too before the novels. Can you tell us a little about your Christmas At The Cupcake Cafe? I can! It's about Issy who has set up her own bakery business in London and how she copes when her boyfriend gets offered an amazing opportunity in New York. And it has lots and lots of yummy Christmas recipes too. Well I adore New York, especially at Christmas- New York and London both do Christmas beautifully but in very different ways so that was inspirational too. Yes, it's weird weird weird. I've tried saying hello but people get really unnerved and try and hand the book back to you and things. Or they think you're a nutter. Don't do it. The wonderful art department at William Morrow works really hard on them. I thought they did a good job with One Day and I can't wait to see Me Before You. The new Cormoran Strike, which is fantastic, and Yeah Yeah Yeah by Bob Stanley, a history of pop songs. Tamar Cohen. 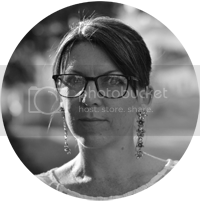 She writes these amazing psychological twisty thrillers, check them out! Anywhere. Cafés, trains, bed aeroplanes. I really don't care. I once finished a book in the back row of a cinema where my kids were watching a rescreening of Chicken Run. The book had a few more chickens in it than I'd originally planned, but apart from that I'm pretty flexible. I wanted to be a nun who wrote at night to support the convent. I am beyond delighted only one of these came true. I would love to be one of those really classy Sandra Bullock ballsy broads. but I'm more of a "heroine's quirky best friend who doesn't get the guy' type. Top drink to make you tipsy? Well I'm in Texas right now so- margarita! Shopaholic or shopadon't? I love to shop but am painfully cheap. So a mix of both. Sky high heels or closer to the ground? Converse and sandals. Oh it would be nice to be groomed! I honestly do not know where people get the time. I play the piano so I spend my day typing/ hitting the keys; a manicure would be pointless. E.L. James or Jilly Cooper? Every author I know owes a debt to the one and only JC. Cry baby or tough cookie? I would like to lie and say I'm a big softie cry baby but if I'm being honest, I'm a woman who runs their own business in a competitive arena : you've got to be a little bit tough! Especially in writing. You need to get your thick skin working. Unless it's that episode of the Simpsons with Dustin Hoffman as Lisa's substitute teacher when I bawl like a baby every time. 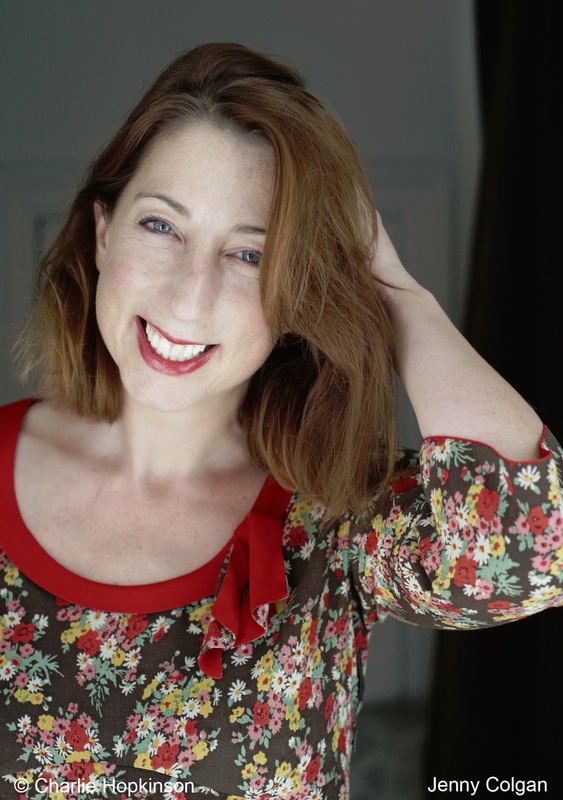 Jenny Colgan is the author of numerous bestselling novels, including Christmas at the Cupcake Café and The Loveliest Chocolate Shop in Paris, which are also published by Sphere. Meet Me at the Cupcake Café won the 2012 Melissa Nathan Award for Comedy Romance and was a Sunday Times Top Ten bestseller, as was Welcome to Rosie Hopkins’ Sweetshop of Dreams, which won the RNA Romantic Novel of the Year Award 2013. Jenny is married with three children and lives in London and France. I love Jenny's books ... I list them on my "top 10" books for the year on my blog! 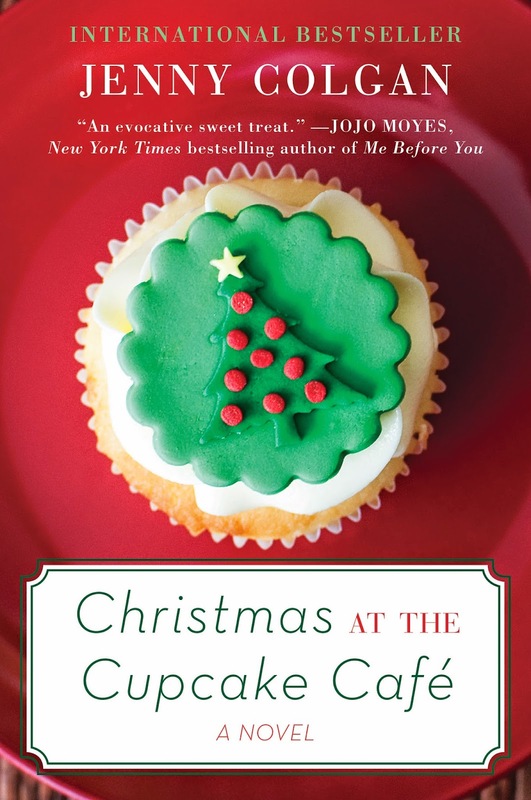 Thanks for reminded me about Christmas at the Cupcake Cafe - it will make a great stocking stuffer from my husband to me! My pleasure girls at Tasty Book Tours! Kim, Jenny is a wonderful writer - I think this would be a perfect stocking filler!